Organic synthesis either in bench or industrial scale is traditionally carried out in batch reactors in which substrates, reagents and catalysts are mixed and left to react under controlled conditions (pressure, temperature, inert atmosphere, stirring) until the end point is reached. The catalyst, if supported on an insoluble polymer, is then separated from products by filtering off, washed and reused in another batch run by addition of fresh reactants. Automated procedures are useful alternatives in term of costs and time and, in this context, combinatorial and parallel synthetic methods have been effectively applied for pharmaceutical drug discovery and fast optimization of the reaction parameters. Continuous-flow systems, that have been long used in industrial processes in which gases passed over solid inorganic or organic catalysts, are experiencing a growing interest also for laboratory use, since they provide increased safety, reproducibility, facile automation and extension to larger scale continuous production [23, 24]. Development of microwave technology and engineering of flow-reactor devices in conjunction with the availability of a variety of supported catalysts and non-conventional fluids as sCO2 or ionic liquids, have stimulated the design of novel continuous-flow processes  leading in most cases to a marked gain in space-time yields (amount of product per unit volume and per unit time). According to macro- or micro- porous nature of the polymeric support, insoluble immobilized catalysts are mainly used in packed fixed- or fluid-bed reactors, that consist in thermostated glass or steel pipes filled with catalyst beads in which reagents and substrate are continuously pumped. 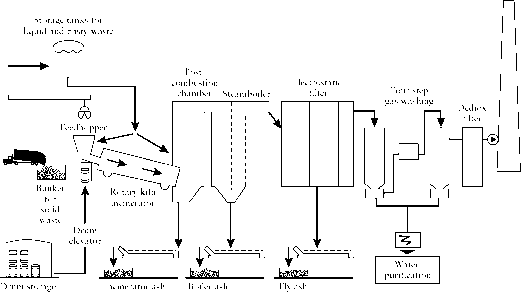 By suitable adjustment of feed flow, the maximum conversion could be reached during the residence time of reactants inside the reactor and, in optimal conditions, the effluent should contain only the desired product, available in pure form after little or no workup. Compared to a batch process, the simultaneous occurrence of the reaction and catalyst recycle leads to reduced solvent waste while the lack of stirring preserves catalyst from its mechanical degradation. Although inorganic supports are preferred to organic polymeric ones, that suffer some limitation deriving from their swelling properties, immobilized chiral catalysts on polystyrene resins  and self-supported catalysts  have found application in enantioselective hydrogenations  and some C-C bond forming reactions . The addition of diethylzinc to aldehydes, performed in a packed bed reactor (10 x 70 mm) loaded with polystyrene-immobilized catalyst 5 under a flow rate of 0.24 ml/min, is a representative example from recent literature (Scheme 4.3a). In a single pass of 9.8 min benzaldehyde was completely converted with 93% ee and the residence time could be further decreased (at flow 0.72 ml/min) with highly reactive aldehydes. So, productivities up to 13.0 mmol/h per gram of 5 and up to 24-fold reduction of the reaction times in comparison with the results obtained in batch were calculated . 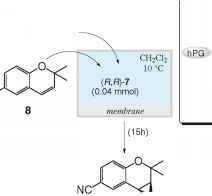 The same continuous-flow reactor gave excellent results also in consecutive reactions with different substrates as well as in the synthesis of diarylmethanols  with arylboronic acids/Et2Zn. Monolithic composite materials have been prepared by polymerization of suitable monomers inside the pore volume of a block of inert and highly porous organic or inorganic material (polystyrene, carbon, glass) to give small polymer bridged beads (1-5 im) entrapped into the microchannels of the support. The small diameter of polymer particles results in large geometric surface area leading to enhanced accessibility of catalytic active sites, while the limited polymer swelling inside micropores strongly reduces the occurrence of uncontrolled fluid dynamics and pressure drops often observed with randomly packed beds of gel-type resins. Encapsulation of monoliths in glass, PTFE or stainless steel cases has allowed the construction of a variety of reactors for flow chemistry and their features have been tuned by adjustment of porosity, composition and shape [32, 33]. Scheme 4.3 Continuous-flow processes in packed bed reactors retained behind an ultrafiltration membrane while the products are continuously removed in the permeate solution. Solvent-stable membranes with different permeability and molecular weight cut-off have became available and they have been mainly used for the selective separation of polyethylenglycol- or dendrimer-sup-ported catalysts from reaction mixtures in batch reactors , but an increase in continuous-flow applications [36, 37] could be expected. A continuous-flow membrane reactor containing a CH2Cl2 solution of catalyst 7 supported on hy-perbranched polyglycerol (mol weight = 8000) has been recently developed for salen-promoted epoxidation of chromene 8. Maintaining simultaneous delivery of reagents and substrate into the reactor for 15 h the desired epoxide was collected at reactor outlet in 70% averaged yield and 92% ee with a calculated TON tenfold higher than that obtained for the same reaction in batch (Scheme 4.4). Furthermore, it was demonstrated that the continuous process ensured decreased catalyst leaching and deterioration, in comparison with four repetitive batches using catalyst recycled after its selective precipitation, . Along with advances in even more sophisticated techniques for device miniaturization, in most cases borrowed from the field of semiconductor microelectronics, microreactors have emerged as very attractive tool for "green" chemical reactions in both laboratory or preparative scale [39-41] and much research has been devoted to their engineering and manufacturing [42, 43]. In their simplest form, a microreactor consists in a network of small size (10-500 im) channels etched into different materials as silicon, glass, metals or polymers and connected to a series of reservoirs for reactants, products and waste to give a complete device (''chip'') with overall dimensions of few cm. The narrow channel dimensions lead to unique advantages the most important of which are low solvent consumption and decreased waste, fast and homogeneous mixing of the reactants, efficient heat-exchange that allows better thermal control preventing hot spots and providing better safety in solventless or exothermic reactions , sometimes without need of external cooling. Furthermore, facile automation and short reaction times make microreactors well-suited for reactions involving labile intermediates , rapid catalyst screening and method optimization  or kinetic investigations . Since the peculiar features of microreactors are strictly related to the small dimensions of the channels and copies of a given chip are accessible at low cost from replication of the master, once a chemical process is developed in such miniaturized systems, the productivity of the desired compound can be easily increased  by using multiple reactors in parallel (numbering up) so avoiding the classical costly and time-consuming scale-up. Control of fluids in microreactors is mostly provided by hydrodynamic pumping with syringe pumps or peristaltic pumps, a method that is compatible with any liquid or material but is limited by capillary resistance that exponentially increases with decreasing the channel dimensions. As an alternative electrokinetic flow, driven by a potential difference applied between the inlet and the outlet of the reactor, can be used in the presence of polar solvents or when the device materials develop surface charges, as in glass or poly(dimethylsiloxane). Whereas in classical reactors mixing is induced by convection, that can give rise to inhomo-geneity and concentration gradients often variable in function of vessel geometry or stirring conditions, in microreactors complete mixing is affected by diffusion alone and usually achieved in microseconds through T- or Y-shaped geometries joining the channels. The number of catalytic organic reactions performed in microreactors is continuously growing [49-51] and increased reaction rates, yields and selectivities compared to those obtained in conventional reactors have been reported in most cases. However, the extension of such technology to enantioselective processes is still limited to few examples [52, 53]. Aldol condensation of aldehydes and acetone promoted by tetrazole 9 in a microreactor was reported in 2009 as the first application in organocatalysis field and, in comparison with the batch procedure, higher working temperature and lower catalyst loading were tolerated without enantioselectivity deterioration. Good results were achieved in 10-30 min at 60°C using a 1.0 ml or 250 il glass chip reactor (Scheme 4.5a) and in the reaction of p-nitrobenzaldehyde with cyclohexanone the ee for anti-adduct was higher than that obtained using a batch process (81 vs 59% ee). The same conditions were also effective in the Mannich reaction of cyclohexanone with iminoglyoxylate  (Scheme 4.5b) and it was demonstrated that larger channel size (reactor volume 4.0 ml) resulted in slightly lower productivity. 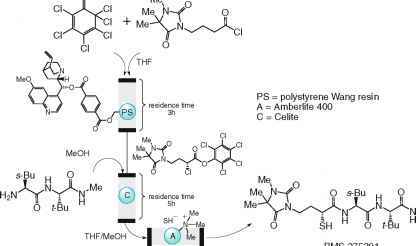 It also need to be shortly mentioned that continuous-flow devices are ideally suited to perform multistep synthesis in which a given substrate can build up chemical complexity by flowing through serial assemblies of microreactors or columns. Indeed, after the substrate has been subjected to the first reaction of a synthetic sequence in a continuous-flow reactor, the outlet stream can be directed into a second reactor where another reaction step occurs and so on until the final product is collected at the end of the last reactor. The methodology, complementary to classical solid-phase synthesis, could gain benefits from avoidance of extensive workup protocols, fast optimization and control of the reaction conditions, and dramatic reduction of both time and manual handling. As a representative example of this approach, the five step synthesis of metalloproteinase inhibitor BMS-275291 has been achieved in about 15 h, against several days required with conventional lab equipment, through a key step of asymmetric a-chlorination promoted by quinine loaded on Wang resin followed by amidation with a peptide and sulfidation reactions  (Scheme 4.6).